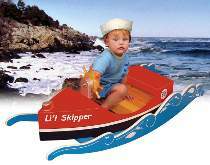 Your little skipper can sail the seven seas in their own rocking boat. Let them navigate their boat by steering the ships wheel! Designed for 1-1/2 - 4 year olds. Patterns drawn FULL SIZE. Measures approximately 48"L x 18"W x 16"H. Order two ship’s wheel decals, two Lil Skipper decals and one package of mug pegs for steering wheel separately below. Lil Skipper Special includes W3003 Lil Skipper Rocking Boat Plan, two #8109 decals, two #2010 decals and ten mug pegs. A $33.85 value.